Confession: It's been a month of exhausting joy. I've recently been hit with a 2 by 4 of overwhelming reasons to be joyful about my life as a mother. A few of those reasons happen to be two friends of mine lost their sweet baby girls. One of them passed away the day after my sweet Baby M was born and the other just happened this past Wednesday. I haven't been able to get these two sweet families out of mind and wishing there was something I could do or say to take their pain away. I'm sure they're grateful for the words of comfort those they know have offered and the service done on their behalf. But I can't help but think how hard this has been for them. My prayers are filled with their names each night, praying for peace and mended hearts as they continue here on earth while their sweet angels watch over them. Because of this I have promised to be a more grateful mother. My Baby Boy M had just come to this earth when I heard about Baby girl C and I squeezed him tight and was grateful I got to take him home from the hospital. When I heard about Baby girl H and her passing, it was later in the evening while I was trying mightily to get Baby M back to sleep and I was over come with the grateful feeling that I could experience such exhaustion. Because my sweet friend will never be able to feel that. I was grateful I could be so tired for such a wonderful, healthy miracle in my life. I've been doing really well. I'm rather in shock at how well, emotionally, I've been doing. And I keep waiting for things to plummet and to go dark. But I've been keeping steady. I'm not in uncharted waters with having a newborn, I've done this once before and so I feel like I know what to expect. As for Little P, I'm constantly experiencing new things with her that test my patience and temper, and also get to have proud momma moments when she yells, "LOVE YOU" over the breakfast table just because. Or when Baby M cries and I don't hear him she'll come tell me because she really loves her baby brother. This whole mommy thing sure is sweet. I'm sweetly reminded each time I get to stare into BOTH my little ones baby blue eyes, that these two angels aren't just mine, but their Heavenly Father's too and He's trusting me with them... I gladly leave the piles of laundry, and the dirty dishes, and the diaper covered floor alone and take time for my children. I hope you can have these sweet moments and savor them. It's quite wonderful. the unbalanced, grateful, mother of two. Confession #19 : Exhaustion at its finest. Well I've survived 2 weeks. I can say that week 2 has been way easier then week 1. I was completely depressed the first week. Mostly because I still hated how things happened with the c section and how badly my body ached. Now that I'm doing better physically, my emotional state is starting to even out a little bit. I still don't like that I had a c section and NEVER want to experience it again, it's over and one with and I have my baby boy here. Baby M has been having loads of gas issues. We took him into the doc yesterday because his breathing became different and he wouldn't stop crying. With the use of an x-ray machine we discovered that he has an unusually large amount of gas filling his intestines and causing him lots of pain. So, he is now on gas drops. Last night was rough because he still has his days and nights mixed up and his tummy hurt. I was up with him from about 2-6am trying to comfort him. Then at 7am Dad took over and for a solid hour was a farting machine and after he ate his breakfast, he had a huge poopie explosion all over me and our bed. I wasn't even a little bit irritated that I had to wash everything that early in the morning, I was just grateful he pooped. I found myself saying, "way to go!" and "keep it up!" every time he tooted. You don't realize how important gas and pooping is, until you can't anymore. Poor little man. Today has been much better, he hasn't been as fussy and he's sleeping more comfortably it seems. I'm amazed at what the human body can do on only a few hours of sleep and despite being up all night, having a headache that won't go away, an insanely messy house, a itchy rash ( on my incision) that won't go away either, a massive amount of poop covered laundry to do and a flabby body that I won't be able to work on for months.... I'm just happy watching my little guy sleep in his swing and Little P watching Thomas the Train. I'm totally exhausted and I don't really care that I am. In other news. I'm an aunt! There are loads of nieces and nephews on hubby's side of the family but until recently my two little ones were the only ones to fill up grand baby slots on my side. Sweet little Baby A came early Monday morning to my brother and sister in law and she is gorgeous. Just like her mama. She's definitely got "the cheeks". She isn't alone in that though, my Little P has them too. Baby Boy M got away with that one and inherited his Daddy's slimmer facial features. Still taking things one day at a time. Although it really feels one minute at a time. And today...today I'm grateful for healthy children. And little baby toots. the unbalanced, exhausted, mother of 2, woman. At my 38 week appointment I was actually in the hospital because I was having regular contractions and my midwife just did the appointment before I went home that night because my baby boy wasn't coming yet. We found out that night that he was transverse (sideways) and not head down. I immediately panicked thinking I'd have to get a c section.. But my midwife was confident that with doing some stretches on my own at home that we could successfully get him turned. So, for the next week that's what I did. I did everything my midwife recommended, and found more things on the internet to try. I was a complete mess all week because I wanted him to turn so badly and I couldn't focus on anything else. Wednesday came around (the 21st) at my 39 week check up and viola! He was head down, I cried laying there on the table because I was so relieved. I was scheduled to do a version the next morning to get him turned, which I didn't need to do anymore, and then they would start my induction. I was also 2cm dilated which made me even more excited that things would go smoothly the next morning and my baby boy would finally be here. I came home that afternoon and still did my stretches just to make sure he stayed right where we wanted me too. We dropped Little P off at a friend's house for the night since the induction was schedule so early in the morning. My mom was headed out from Iowa and I was a happy clam. We went to bed early that night to get a full nights rest for our big day. At midnight I woke up with contractions about 10 minutes apart. I didn't think much of it because this had been happening for several days and nothing came of it. So I'd fall asleep for 10 minutes in between each one. Then at 3 am they became closer together. I decided to get up and move around, drink some water, sit on my exercise ball and then I eventually showered at about 4:30am. The shower helped the most but the contractions didn't lessen at all. I was getting kind of excited that my body was doing its thing all on its own and hopefully that meant things were going to go super fast once I got to the hospital. I got out of the shower and the contractions started coming about 3 minutes apart and they hurt. I had to breath through them and stop what I was doing every time I got one. I called my midwife to let her know what was going on and see if I should go into the hospital early. Well the answering service I called took down the wrong number and I waited for an hour to hear back from her. So after lots of confusion I got a hold of her and she told me to go to the hospital right away. I had woken dear hubby up at this point and he was showered and got everything in the car. We headed for the hospital at 5:45am. When I got there I could barely breathe in between each contraction and they quickly got me admitted and into a bed. Once I got into bed they check me and brought the ultrasound machine in to make sure hew as still head down. I was dilated to a 4 almost 5cm and the nurse could feel feet! NOT A HEAD! I, of course fahhh-reaked out and started crying. Hubby just held my hand and told me everything was going to be fine. So, after an hour of breathing through contractions that were coming extremely fast and then finding out that the ultrasound machine was broke and trying to find a new one I was exhausted. My midwife arrived and she checked me again and I was at 7! There was panic everywhere in the room and it seem about a dozen people were coming and going constantly. They decided to go ahead with the C section and I just couldn't help but cry. This is not what I wanted. Once they poked me a million times to get my I.V started they wheeled me into the operating room and got me set up to get my spinal block. Once that was done it was almost instantaneous that I felt relief and numbness through my whole body. It was the most comfortable I'd been my whole pregnancy and I took that moment to come to terms with getting a c section and calm myself down. They had a mirror in the room so you could see what was going on before they pulled the curtain up by my head. I was strapped down to a table and completely naked. I was rather horrified that all my lady parts were being exposed under a bunch of bright lights. Once they pulled the curtain up all I did was look at hubby, whiled he stroked my hand and face. They told me I would feel a lot of pressure when they were taking the baby out but I honestly felt nothing. He immediately cried as soon as his head was out and they took him to get cleaned off and checked out. I was able to see him the whole time and I just watched and cried and prayed, prayers of gratitude that he was here. I don't know how long we were in there, but it felt like forever before I could hold my Baby M. At one point during the process of being stitched up I started to feel extremely light headed and sick. One of the doc's came over and asked how I was feeling and I said I didn't feel very good. He proceeded to tell me that my uterus was currently OUTSIDE my body to get stitched up. I have no idea why I didn't ask why they were doing that at the time, and wished I would of said something. He reassured me that once it was back in my body I'd feel better. "Well, uh thank mister. I sure hope so." Was all I could think. Once they were finished they moved me into my recovery room and hubby brought me my baby boy. I mostly just felt relief that it was all over and that I wasn't pregnant anymore... but to my surprise that was just the start of everything. My recovery has been rough. I went home after 3 days mostly because hubby couldn't stand it at the hospital anymore and I was hoping I'd feel loads better once I was home in my own bed. We are one week postpartum and I guess I'm feeling okay. Yesterday was rough. I cried most of the day in the solitude of my room with Baby M sleeping away in his bed and Little P with my mom watching movies and playing. I just have this overwhelming fear that my body will never go back to normal and that once I do start feeling a little better and all my help is gone that I just won't be able to handle being a mother of 2. I vented my fears and frustrations to hubby and he very tenderly told me to just take one day at a time. "Don't worry about tomorrow or the next day, don't worry about next week or next month. Just today. That's all you need to do." he said. As simple as that was it made me feel a lot better. He even addressed other issues I mentioned without prompting him to help me. I think it was the first time he's ever done that. It gave me a great sense of confidence in myself, knowing he had confidence in me and was willing to help me along the way. After my little sob fest, we decided to get out of the house. My mom kept the baby while we went to a park and let Little P run out all her energy. I sat in the car and watched as she chased Hubby around and as she daringly went down all the "big' slides by herself and then clapped and yelled for Daddy to go down them too. We also stopped at the grocery store and hubby let me get some donuts, and a Redbox Dvd and he surprised me by buying a "Dad's orange cream soda" My favorite. Today has been much better. I've moved around a lot more and tried to get a few things done just to feel productive. I know there will be much harder days ahead. But right now, I'm only going to worry about today. Excuse me while I go help Little P hold Baby M because she's been asking all day. 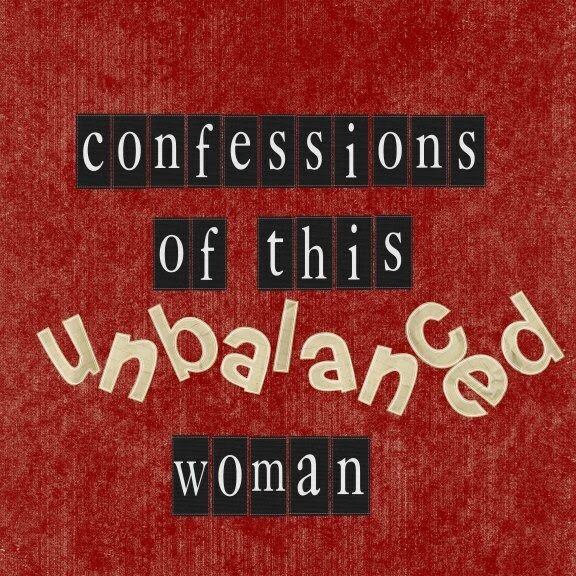 the unbalanced, in recovery, mother of 2, woman. Victory Confession: Phase 2 of my PPD and getting stronger already. I've been on my medication for 7 weeks now. I'm not really sure what I was expecting by taking my medication early or how it would help me this time around. Especially since I started taking it before things even got to a point where it was hard. I am a mere week in a half (or less) away from having my Baby Boy M in my arms forever. I realize things are going to change once he gets here and that's where I'm really going to see if this medication is helping, but so far I've been doing great. There is just a natural emotionally taxing part about the END of pregnancy. You ache everywhere, you feel huge, no sleep, uncomfortable no matter where you sit or lay down. All you want is the baby OUT and out NOW! I've definitely been feeling all of the above but compared to my first end of pregnancy experience I don't feel like I've been as emotional. I remember crying every single night before bed that I hadn't had my baby yet for the last 2-3 weeks of my pregnancy. I've only done that ONCE so far. Emotionally and physically I'm ready to have this baby there is no doubt about it but I have a sense of content that he'll come at his own time. Truly, the only thing I've been worried about is how Little P will handle all this change. I know I've been making things out to be worse then they will probably end up being. And she always surprises me with how well she transitions into a new phase of life. I feel so blessed that things have gone so smoothly with her in our 2 short years together. I've also been feeling grateful for supportive friends and family. Namely my mother, two wonderful Iowa natives that know me inside and out, not to mention such wonderful mothers and a newer friend that I told you about here awhile ago and could NOT have survived our first year here without. My mother. Oh my lanta. I call her everyday and tell her the same things and whine and complain and every time without fail she offers sympathy and reassurance. I've always been open with my mom about everything and she always know the exact thing I need to hear. I hope I can be that same way for my children. My Iowa girls. I get rather personal on this blog but using names isn't one of them since this is a public blog that anyone can read I do like to have some discretion. These two ladies have been so great, especially these last couple of months. They have been emotionally supportive and just plain old fun. Lady M has been in my corner since her and I were 4. We've experienced our whole lives together. There isn't much we don't know about each other. She just became a new momma about 8 weeks ago to the THEE most charming little boy in the world and might I add the easiest baby I've ever been around. Never heard the boy cry and he sleeps a lot! Already I can see what a champion his mother is and will continue to be. Lady K is such an example to me of a great mother. Her set of challenges seem to have come all at once and she handles them with such fire and grace. She's always there to give me a good laugh and tell me to keep on going. And my newest friend that I met shortly after we moved here has literally been my life-raft on my hardest days. I don't even know how to explain the gratitude I've felt for her unwavering friendship and shoulder to cry on. I would of drown without her this passed year and know I've found a life-long friend. Minus my mother, these ladies and I got together yesterday for a lunch as my last social HOO-RAH before I become a mother of 2. We talked and laughed and laughed and laughed. The restaurant was completely full when we got there and two hours later we all realized we were the only people left and making lots of noise. It was exactly what I needed. Having other mothers in your life is essential. Creating a bond with them will pull you through. I've been grateful to know I'm not the only one that feels like I'm going completely crazy most days and sometimes don't even want to be a mom on the hardest days. So you current mothers: let's come together. You future mothers: we're here when you need us. Fathers and husbands: encourage her, help her, sympathize with her and accept her. Hopefully you'll hear from me shortly with a short VICTORY post about my new little man. the pregnant, unbalanced, and stronger woman. Confession # 17 - It begins again. Confession # 17- It begins again. Well the journey to continue to overcome my trials continues when it comes to motherhood. As I suspected, this pregnancy, just like the last one has been very taxing on my mind, and my body. It's been hard, just like I remember. As I endure these last 8 weeks, unlike my last pregnancy, I've started taking my anti-depressant. I've been experiencing those overwhelming feelings of sadness, anger and frustration for the past month and dear hubby and I decided it would be best for me to get a jump on things before they get to a point where I feel out of control. I promised myself during Phase 1 of my PPD that I wouldn't let myself suffer again. I have to confess that I did hesitate to start, trying to convince myself I could do it on my own again. But as I read through my early posts at the beginning of my recovery, I remember feeling how dark I felt and how hard it was to get out of that, even with help. So, I've done lots of research and talked with my doctor on countless occasions about this what the best path is to take. Yesterday at my 31 week appointment (and after having and emotionally taxing month of depression) I told her I was ready. She went over the risks with me once more, and wanted to make sure this is what I wanted. I assured her it was. So here I am, starting Phase 2. I'm feeling afraid , but not despair. Something I had a hard time shaking during Phase 1. I'm hoping, praying (daily) even that I can catch this before it gets too bad. My regular outlet of exercise is, at the moment, unavailable to me because Of how much pain I'm in. I'm carrying this little guy extremely low, which has added additional pain in my low back and pelvis, making it difficult to even walk. Can't walk=can't exercise. I have, however, scheduled an appointment for today to see a physical therapist that specializes in low back and pelvis pain in pregnant women. I'm hoping I can rehabilitate these muscles so that once I deliver this won't be a problem anymore. I've been questioned on several occasions if taking an anti-depressant while pregnant is safe and every so often, criticized for putting my unborn baby at risk. First off, all of these people are either without uterus's, or have never experienced PPD. And cannot make reasonable assumptions about MY life choices. I'm not going into this blind. And I'm not going into this uneducated. You need to weigh the risk and the benefit. I can run the risk of my baby being born and not breathing as quickly, and having a moment of fear that something is wrong and realize very quickly that everything is fine and have the benefit that I am emotionally able to take care of my family and be a better mom. As scary as that "moment" will be, I'm willing to take that risk then make myself and my family suffer because I think " I can handle it on my own." When the fact is, I know that I can't without some help. Just as heaven knows, I'm sure I'll still struggle. Transitioning into becoming a mother of two, sleepless nights, breastfeeding, a cranky two-year old and endless amounts of diapers all over the house. But remember what I've been saying this past year in a half?? Control what you can control. That's what I'm doing. Taking control of my life to be a better mother. the pregnant,unbalanced, and medicated woman.